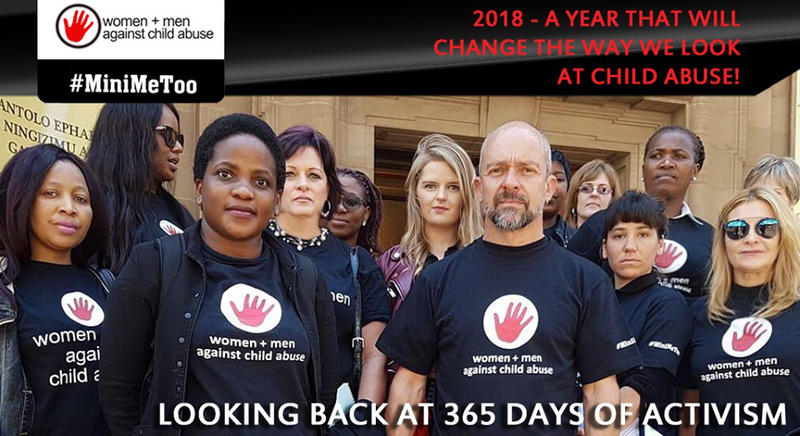 …as another year of 365 days of activism that has given us not just the same disparaging number of new cases, but also some very positive rulings and events that have shown that South Africa does indeed have the most progressive judiciary in the world. show him any consideration for the fact that he is now an old man, and WMACA will be there in future to fight any such attempt by Hewitt to regain his freedom before his jail sentence is served in full. Frankel 8 wanted to pursue a criminal case against their abuser but were unable to due to two primary historical legal legacies still rooted in pre-democratic law. These were the definitions of different forms of sexual abuse and how these related to both time and gender. They fought a battle that challenged the legal framework that made certain sexual crimes against children “less bad” by saying they could not be prosecuted after a twenty-year time lapse, while other had no time limit for prosecution. The second battle was for equality of gender under the law as certain definitions of sexual crimes excluded certain genders. The issue of time and gender in the law both limited the rights of adult survivors to seek criminal justice and a Constitutional Court has rectified this. All persons regardless of how long ago the abuse was, what kind of abuse it was and what gender they were can now request criminal justice. William Segodisho approached WMACA via South African Male Survivors of Sexual Abuse, after being abused repeatedly as a young adolescent male by not just one priest, but two. A Press conference led to a media-supported campaign that saw a priest fall upon his own proverbial sword, confess publicly to what he had done and offering an apology and a settlement. This case has reopened dialogue around church-sanctioned abuse and the confessional being used by priests as protection against prosecution. Chantelle Akers was 11 years old in the early eighties when her father, Salvation Army Captain Lionel Potgieter, raped her for the first time. Since Chantelle bravely approached Women & Men Against Child Abuse three years ago, we have seen Lionel Potgieter use every nefarious way possible to avoid justice, Ultimately, he was sentenced nonetheless this year and will probably spend most of the remainder of his life behind bars. This case has shown that non-contact ‘victimless’ crimes, eg. images of child sexual abuse and torture are still crimes against children, and reiterated our faith in a progressive judiciary. A harsh sentence was imposed and will send a strong message to those using the suffering of children for profit. In contrast to octogenarian coach Bob Hewitt, the furor around Parktown Boys coach Collan Rex (22)’s spree against pupils of this elite school highlighted an element of historical abuse. As reflected in Luke Lamprecht’s report, there were numerous elements of historical abuse that came to light. Extremely groundbreaking in this ruling by Judge Peet Johnson was that Rex couldn’t use his own abuse as a mitigating factor in sentencing – we as a society are one step closer to realising that your own abuse doesn’t give you carte blanche on the next generation of youth. Error: Error validating access token: Session has expired on Saturday, 23-Mar-19 09:12:20 PDT. The current time is Wednesday, 24-Apr-19 17:01:01 PDT.